Rarely do we see true paradigm shifts in cosmetic surgery. Neurotoxins are certainly a prime example of a new technology that replaced previous treatments with increased safety and less recovery. When Botox arrived in the early 1990’s the “pretty poison” caught on like wildfire and soon became the most commonly requested cosmetic treatment internationally. In the early days, patients wanted paralysis. It was not uncommon for patients to complain or return for touch up if even a slight amount of movement was present. It got so you could walk down a busy street or turn on TV and tell exactly who was “Botoxed” and what areas were treated. At that time, the most common areas requested for treatment were the glabella, frontalis and lateral canthus, in that order. Over the past decade, much has changed in how patients desire animation. Gone is the overt reated paralyzed mask look. It is a rare patient that does not want some remnant of normal animation. This is especially true for the frontalis (forehead) region. Not being able to frown is rarely a problem as we can communicate anger or displeasure in so many ways. Not being able to use the eyebrows to communicate, however, is a bigger problem. The average patient desires the ability to raise the brows as we communicate so much (often silently) with the upper face. Not being able to convey surprise, interest, skepticism (raising one brow), etc. is a setback for the contemporary patient. Adding to this problem are females with dermatochalasis (baggy upper eyelid skin). Many females are habitual brow raisers. They raise their brows from the time they wake up till the time they fall asleep. This is done in part to lessen the effect of the excess upper lid skin. A patient with excess upper lid skin will look younger (less skin) when they elevate their brows. If Botox or Dysport takes away the ability to elevate the brow, then the excess upper eyelid skin is much more obvious. Getting a neurotoxin in the forehead (or neuromodulator, to be more contemporary) does not make extra skin, it merely prevents brow elevation thus causing the already excess skin to be more evident. Herein lies the problem. Experienced injectors know how to spread the injections and neuromodulator out across the forehead to prevent the bothersome horizontal forehead wrinkles in the center of the forehead, but still maintain enough muscle activity laterally to enable brow elevation. Inexperienced injectors may frequently over treat a patient with upper lid skin excess and this leads to a very unhappy patient. Due to the fact that some patients are more sensitive or more resistant to Botox or Dysport, a normal dose on one patient may knock out all forehead movement on another patient. So….even experienced injectors occasionally may see upper eyelid skin excess from conservative treatment. When injecting a patient who has never had Botox treatment or has never been treated by me, I always recommend 1/2 the normal dose in the forehead. This allows me to evaluate the patients sensitivity and response to the treatment. If the 1/2 dose is not adequate, they can always return for a touch up, but if the 1/2 dose is adequate then the full dose may have caused over treatment. You can always add more Botox, but you cannot reverse it. Good rule to practice by! This is even more important in patients that have low hair lines or short foreheads and are having the glabella and frontalis simultaneously treated. In these patients, the glabellar dose can be enough to effect the frontalis movement and it is easier to over treat this population. Although this “relative skin excess phenomenon” is temporary, these patients can be more unhappy that a patient with a permanent surgical complication. This group can be disproportionately unhappy about a temporary problem. The best treatment is prevention and conservative injecting. Sometimes these patients will mistakenly confuse the inability to elevate the brow and related skin excess with true ptosis. True ptosis after neuromodulator injection occurs when the toxin diffuse to the muscles that open the upper lid, which is fortunately a very rare problem. Injecting at least 10 mm above the superior orbital rim will prevent this complication. A related problem is the “Mr. Spock” eyebrow. This devil brow situation occurs when the medial brow does not move but the lateral brow is untreated. This is a very unesthetic look and is easily fixed by simply injecting several units of drug into the lateral frontalis region. Due to overtreatment, the desire to look natural and the “Botox upper lid skin excess” problem, the frontalis region has dropped from the second most requested facial area to the third. The most commonly requested facial regions in my practice are the glabella (still king) the lateral canthus (Crow’s Feet) regions and finally the frontalis. Another phenomenon that I more commonly see is “patient customization” of neuromodulators. 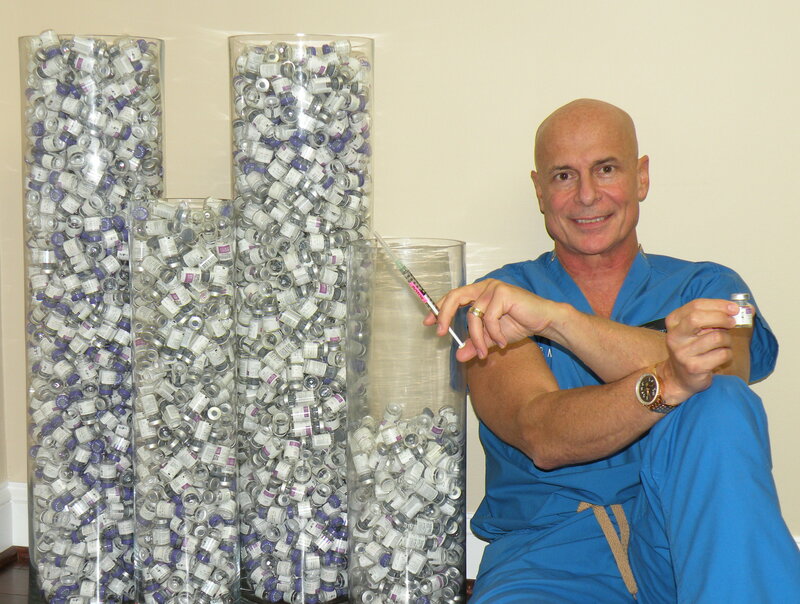 I am an Allergan Diamond level Botox provider and the largest solo injector in my state, so I have been treating some patients for over 12 years. As time has passed, many of these patients request “a la carte” Botox treatment. By this I mean that they desire smaller doses and come to the office with a “map” of their face and where they want the injections. At first I thought that this was related to the economic recession and to some circumstance it may be. What has become clear is that many patients don’t want to look over treated and like what Botox or Dysport does, they just don’t want as much of it. Alternately, many astute patients have learned by trial and error, what doses and patterns produce the most aesthetic effects on their face. They want do duplicate this injection dose and pattern and therefore it is important for the surgeon to record the area and dosages of the injections at each appointment. This way, when a patient returns and says, “do exactly what you did last time”, the surgeon has a map. Some of my colleagues become miffed when patients attempt to direct their treatment, but I think it is overwhelmingly a positive thing. We are giving the patient what they want and the customer is always right. In addition, they may save some money, making them even happier. For over 100 years, doctors have been administering medications with needles. I can’t think of any single factor that patients of all ages hate about seeing the doctor that is worse than the fear of needles. Besides scaring patients, many health care workers are injured or infected from accidental needle sticks. There is nothing fun about needles! There are hundreds of scientists and researchers constantly working on alternate medication delivery systems to get medications in the body without using needles. We have made good progress with numerous medications. Patients with chronic pain are able to get pain medication from patches applied to the skin and numerous other medications can be administered in this manner. I predict that in the future, we will even be able to provide general anesthesia without needles or tubes in ones throat. A topical, non injectable form of Botox (botulinum toxin A) is impressing researchers and is in phase II clinical trials. Revance Therapeutics is a private company in Mountain View, California that has developed a gel that is mixed with the Botox or Dysport that allows large macromolecules to cross the skin and provide local and targeted treatment of the muscle that causes “crow’s feet” wrinkles. The company calls this technology TransMTS (macromolecule transport technology) and this technology is based on a single, straight-chain peptide that allows the skin to accept the medication instead of preventing absorption. To get a bit more technical, adding a peptide as a separate component to the neurotoxin allows the medication to cross the skin. The peptide is said to form an ionic bond with the toxin and the peptide also has a protein transduction domain (PTD) which allows the medication to penetrate the skin. The protein carrier featuring (PTD) holds on to the cell membrane and allows larger molecules to pass. Currently, there have been over 600 crow’s feet regions treated with this technology with impressive clinical results and without complications. Studies are also in place to use this topical application to the under arms for control of sweating. No mention has been made of how long the treatment takes or how long it lasts and there will certainly be variables that effect results in given patients. In any event this new technology is very exciting and representative of what the future holds for painless application of medicines. This would be a very welcome addition in the cosmetic facial surgery arena. If Allergan’s Botox is Goliath, then Medicis and their new neurotoxin is David. No one can argue that Botox has enjoyed a monopoly in the United States for past 15 years. After all, Botox was a true paradigm shift in cosmetic surgery. Never before, without surgery, could a patient have wrinkles disappear. The introduction of Botox was something so different and so easy that it truly heralded in a new era known as minimally invasive surgery. What began as a “pretty poison” has grown into “cosmetic maintenance” and now women and men get regular Botox injections with the same regularity that they get their hair colored or teeth cleaned. Botox has not only continued to be safe and effective, but has gone on to treat many conditions from headaches to hemorrhoids. Botox has gone largely unchallenged and Allergan has become a corporate giant due to its sales. Second to Viagra it is the largest selling drug. A brief challenge came in the “at the turn of the last century” with Myoblock, a similar product but chemically different. Unfortunately for Myoblock, it did not live up to the effectiveness of Botox, and its popularity was short lived. It is still used for the few patients that have a resistance to Botox, but is a small player. Dysport is chemically very similar to Botox and has been used in the United Kingdom for 15 years. It varies from Botox in its biochemistry and protein structure but basically does the exact same thing. This drug has recently received FDA acceptance and will be sold in the United States under the same name. Dysport will make a big bang with the media upon it final FDA acceptance and rumors will fly. The Dysport FDA trials showed that Dysport took effect somewhat faster than Botox and basically lasted the same amount of time, about three months. Why challenge the king of neurotoxins (more politically correctly called neuromodulators) with a drug that basically does the same thing. I call it Coke versus Pepsi marketing. Consumers and surgeons desire choices in everything from clothes, to cars to, carpet and want choices. There is also some bragging rights from being the “new kid on the block” (just ask Red Bull). Cosmetic consumers and media are fascinated by “new” technology and if it is new then it must be better. Frequently this does not pan out, but a well marketed and effective competitor can certainly gain market share. When all the US automakers were getting bailed out by the Federal government, Toyota (who was a newcomer to this country) remained strong. To cut to the chase, Dysport is exciting because it is new and is also taking on heavyweight Botox. It is likely to become a popular competitor. What remains to be seen, and could make the difference in the wrinkle wars, is how Dysport is priced in comparison with Botox. If Medicis significantly undercuts Allergan, Dysport could potentially displace the king. I doubt that this will happen as corporate America is not fond of less profit. A similar scenario occurred with Restylane, the revolutionary lip and wrinkle filler from Medicis. This was the first new filler that was FDA approved and made a meteoric rise to the top of facial injectables. There was no significant competition for about 4 -5 years until Allergan obtained FDA approval for Juvederm. In the pre release period, much speculation occurred as to whether Allergan would significantly undercut the pricing of Restylane. Guess what? They did not. Their pricing was almost identical and Juvederm no doubt took a chunk out of the filler sales dominated by Allergan. Competition is generally a good thing as it offers the public more choices and can sometimes drive down prices, but don’t look for this with aesthetic companies. They figure if patients will spend $500 for X, then they will spend it for Y. Time will tell. To find out more about Botox, Dysport and other cosmetic facial surgery procedures, visit www.lovethatface.com.